This course answered soo many of my questions. I had some questions after watching the composition classes and the creative environments class, even the perspective and building backgrounds class. How do you go about drawing interiors that are more interesting than your standard square and how do you fit interesting elements into them. Will Terry’s explications have progressed my skills to a whole new level. I also appreciate how he takes his time with the explanations and breaks things down step by step. These videos are about more than just how to do a drawing challenge, they teach you a lot of different things that are helpful when working on other pieces as well. I've found my new artistic goal, to become good enough to do that kind of painting. Will breaks down this daunting challenge into manageable chunks. Lots of useful tips for building your game plan and workflow. I feel ready to tackle the challenge now! Really enjoyed this and was able to pick up some very valuable tips on putting together a complex image. Will is great at explaining complex concepts simply and understandable. He knows how to feed his students an elephant by giving them bite size lessons that are easy to digest. I am excited to continue to work on my project and this class is chuck full of little gems of wisdom and helpful tips to keep me improving on my journey to improve! 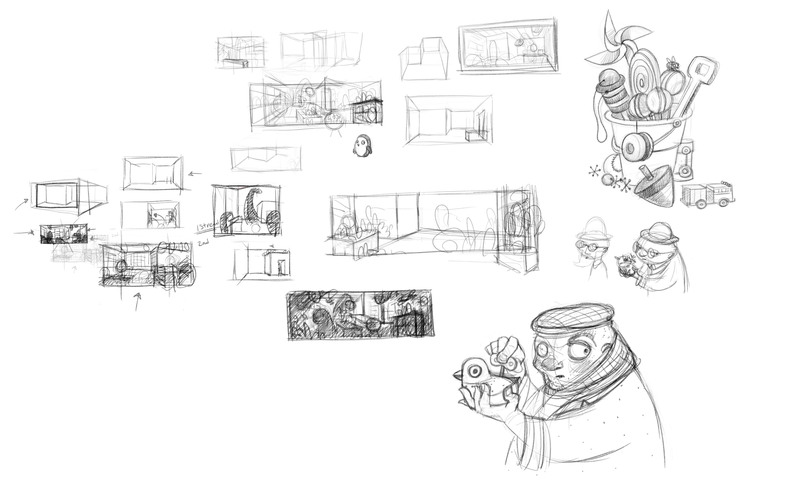 I loved the info about molding and changing your thumbnail crop, and also about visualizing your space in 3D. Loved this course, thank you Will. Design an image with ONE strong focal point with at least one figure or animal that tells a visual story. Include 50 different recognizable objects in your illustration. You may not count items that are attached to the interior or exterior of a structure such as flooring, lighting, cabinets, signage, roofing, windows, shelving, fencing, trees, etc. If you need tools to take it out of a room, out of the ground, off of a building you can’t count it. You may repeat objects like candy canes or heart boxes but only count one of them in your 50. You may not count parts of an object, i.e. a cupcake has 3 parts: cup, cake, and icing but you may only count it as one object. A person is only one object - you can’t count each article of clothing they are wearing...however if they are carrying something in a pocket, on their shoulder, or in their arms you can count it. In order to be counted your audience must be able to identify each of your 50 objects. Have you ever wanted to create a complex image but didn't know where to start? If you haven't you will probably be asked to create such images for books, magazines, adverts one day. One of the most difficult assignments is illustrating crowd scenes, interiors of bookstores, toy stores, party scenes, laboratories, and stadium shots filled with people, objects, vehicles, etc. Learning the tricks and process that other illustrators use to organize drawings like this is invaluable. Will Terry has been teaching this assignment for his UVU classes in Utah for the past 6 years. He is launching this as an open challenge to anyone in the world! Can you draw 50 things in one illustration with one main focal point? Only you can answer this question! Even though this class is presented in a digital format it is valid for any medium including: pencil, charcoal, pen, digital, etc. This is an intermediate to advanced video. Experience with composition is recommended - please watch Creative Composition here at svslearn.com as a pre-requisite. And if you post your own version on social media, don't forget to hashtag it #draw50things!